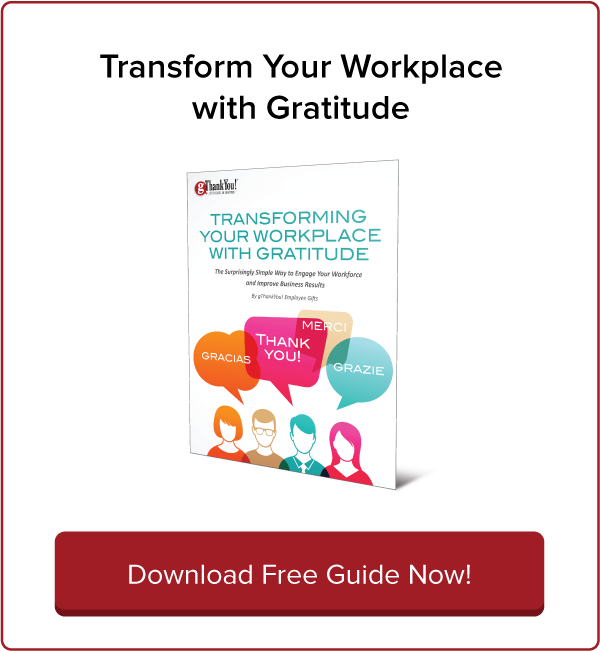 5 Halloween Contest Ideas for the Workplace | gThankYou! Need Halloween contest ideas for the workplace? It’s not too late! 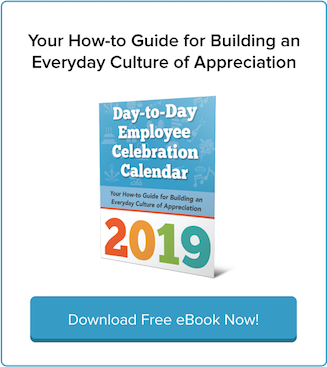 You still have plenty of time to plan something fun and engaging for employees. Your instincts to celebrate Halloween in the workplace are spot-on. Halloween is an active, hands-on holiday and popular with people of all ages. A record 179 million Americans are expected to celebrate Halloween this year. Halloween “brings out the creative side in all of us, no matter what age, and allows everyone to show off and have a good time in any way they choose,” Rachel Farley writes in an Ogemaw County Herald editorial. It may seem like fun and games, but done right, Halloween contests and other activities feed workplace creativity and team-building. Embrace Halloween! 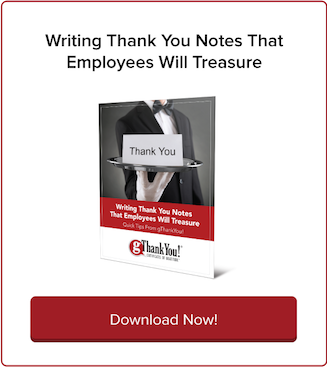 Your employees (and customers) will be glad you did. A Halloween contest may just be “for fun,” but it has deeper engagement potential — so as you’re planning your contest, consider the research on competition in the workplace. Some competition in the workplace brings out the worst in people: fear, anxiety, mistrust and even unethical behavior. Other times, competition brings out the best: creativity, motivation, bonding. What makes the difference? It depends on how the competition makes employees feel, according to Harvard Business Review. Of course, the stakes are a little lower for a Halloween contest vs. a work-related competition, but the same rules applies. Encourage healthy competition by recognizing participants, encouraging them to use their unique skills and offering plentiful prizes. Halloween contest prizes don’t have to have a lot of monetary value — small bags of candy, Halloween trinkets or $5 gift certificates are just right. The key is that they’re shared in the spirit of fun and gratitude. Let these Halloween contest ideas spark your own creativity to plan your workplace’s best Halloween celebration yet. Don’t forget to include remote employees and others who aren’t able to partake on-site — use social media or your company’s internal communication system to share photos and videos and invite participation. A pumpkin-carving contest is a great spontaneous activity for the workplace. It requires virtually no advance planning beyond purchasing pumpkins, carving utensils and plastic tablecloths to contain the mess. Put on a good Halloween playlist and invite everyone to let their imagination take over. Need some carving inspiration? Check out the thousands of pumpkin-carving pictures on Pinterest from pumpkin carvers who really take it to the next level. Don’t forget to publicize costume rules in advance so there are no unpleasant surprises. SHRM has advice on creating costume rules for the workplace. Have a team of pet lovers? Host a pet costume contest, either on-site or by asking employees to bring in a photo to pin on a display board in a common area. Need a contest that’s super simple and fast to assemble? There’s nothing easier than a guessing contest for how many pieces of candy are in a big jar. Perfect for break rooms and gathering places, a “Count the Candy” contest is also a great add-on to your Halloween decorations or as a conversation-starter with customers. Sign your team up with a local run/walk or organize a Halloween-themed dance-a-thon to raise money for a good cause. Be sure to coordinate it with any wellness programming your company offers so employees can get recognition for their participation. Cubicle-decorating is the classic workplace Halloween activity, but think beyond the office. For example, if your company has a lot of truck drivers on staff, invite them to submit a photo of their decorated cab. Make it a team effort! Working together to put up a Halloween display is a great team-building activity and allows teams to express their unique group spirit. Click to download your FREE guide, “20 Ideas for Halloween Team-Building” and start planning the fun! 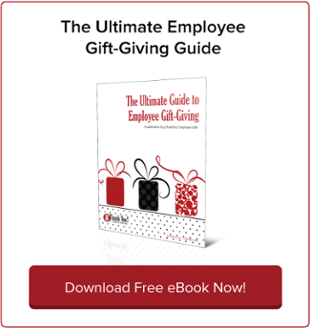 Contests are just one cost-effective method for engaging and appreciating employees. 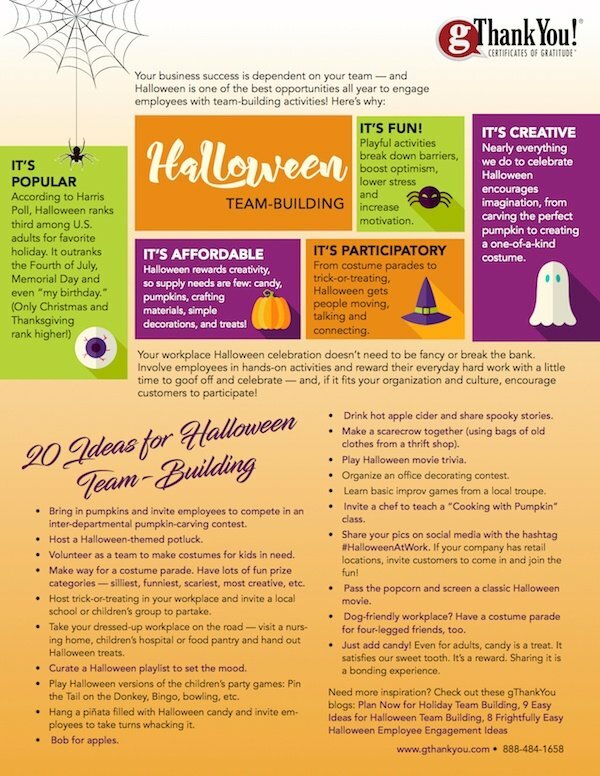 Find more fun team-building activities for your staff in our free one-page guide to “Halloween Team Building“ — and start planning today. Need talking points to convince management a Halloween celebration is a great idea? Look no further. We’ve also put together 20 ideas for fun, engaging and time-tested Halloween activities to please any workplace. We hope you and your workplace have fun this Halloween! Turkey Gift Certificates, Ham Gift Certificates, and Turkey Or Ham Gift Certificates by gThankYou are America’s favorite employee gifts and can be redeemed for any brand (Turkey, Ham, or Turkey Or Ham), at virtually any grocery store in the U.S.
To learn more about gThankYou, watch our “About Us” Video and visit gThankYou today!